The availability of the Internet makes it possible to overcome what has long been the principal objection to the replacement of the income tax with a national retail sales tax: the fact that a flat-rate sales tax hits low-income people hardest. As far as I know, I’m the first to suggest a graduated retail sales and services tax. A graduated sales and services tax is now technically possible, because, thanks to the Internet, the tax can be collected at the point of sale, with a tax rate that is higher for those purchasers whose consumption spending is higher in a given year. If a graduated retail sales and services tax replaced the income tax, investment would soar—because investments would not be taxed. Foreign investment would be drawn to the U.S. The stock market, savings and employment would rise substantially. Entrepreneurship would entice far more people into business. Consumption would rise, too, as made possible by new wealth. Because investments would succeed on their merits rather than on their tax effects, inefficiencies and distortions in the economy would be reduced. 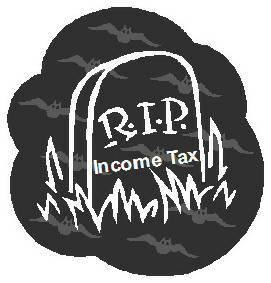 In contrast to the way things are with the income tax, compliance costs would be minimal. There’d be no tax returns to file, other than merchants’ reporting of their sales-tax collections. If you have the ear of a senator or representative in Congress, you might suggest consideration of the matter. It couldn’t help but be an improvement!